When Microsoft released Microsoft Office 2007 (ie, Word 2007, Excel 2007, PowerPoint 2007 etc), they introduced a new file format. The old versions of Office (2003, 2002, etc) can’t open the new file formats (2007, 2010 and later) without this update. If one of your contacts is using Office 2007 or 2010, when they create documents in Word or Excel, the files will be “.docx” or “.xlsx” files… not the old style “.doc” or “.xls” files. 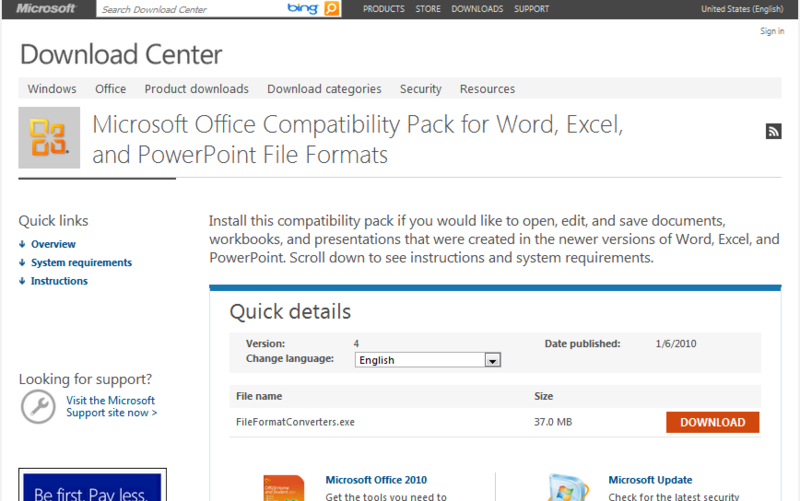 You won’t be able to open those files with your Office 2003 programs unless you download the “compatability pack” from the Microsoft website. You can download the update from this page on the Microsoft website. Click on the Download button to download the file (it’s about 40MB, so will take just a couple of minutes to download using a broadband connection). You really shouldn’t be relying on Office 2003 for much longer, and you should really really be thinking of updating to Office 2010. Office 2010 has an improved interface and is easier/quicker to use, it has better security features, it is better at recovering lost and unsaved documents, and the documents it produces are smaller in size. Additionally, Microsoft will be withdrawing support for Office 2003 in April 2014. After that, Office 2003 will actually be dangerous to use.